Another guide to inflationary pressures is the producer price index (PPI). In the year to February 2013 the output price index for home sales of manufactured products rose 2.3%. In the same period the total input price index rose by 2.5%. The narrow measure of producer prices excludes industries which tend to be more volatile. This volatile industries included food, beverages, tobacco and petroleum industries. Excluding these industries, the producer price inflation has been lower during this period. Input prices are the cost of raw materials used in the manufacturing process. This will involve the cost of metals, plastic, oil and other raw commodities. Again, there is a narrow measure of input prices, which excludes the more volatile industries of food, oil, tobacco, beverages and petroleum. This graph shows the quite significant input price inflation during 2011. Producer and input prices are known as ‘leading indicators’. This is because they will tend to influence future inflationary pressures. If input prices rise, firms will put up their producer prices, and in turn, this is likely to translate into higher consumer retail prices. In 2010 and 2011, we can see a rise in input prices and producer prices. This caused a rise in CPI, suggesting that the rise in inflation was due to cost-push factors. Producer and input prices are a key factor in determining future inflation. 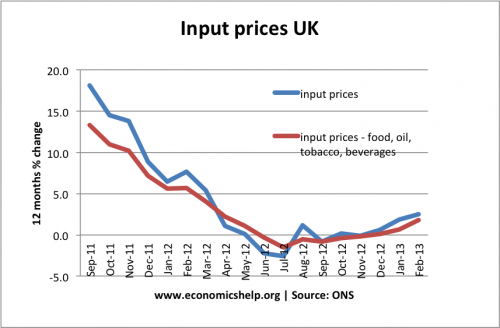 For example, at the start of 2013, CPI is higher than producer and input prices. This suggests that in 2013, there will be downward pressure on the inflation rate from the lower producer inflation rate. 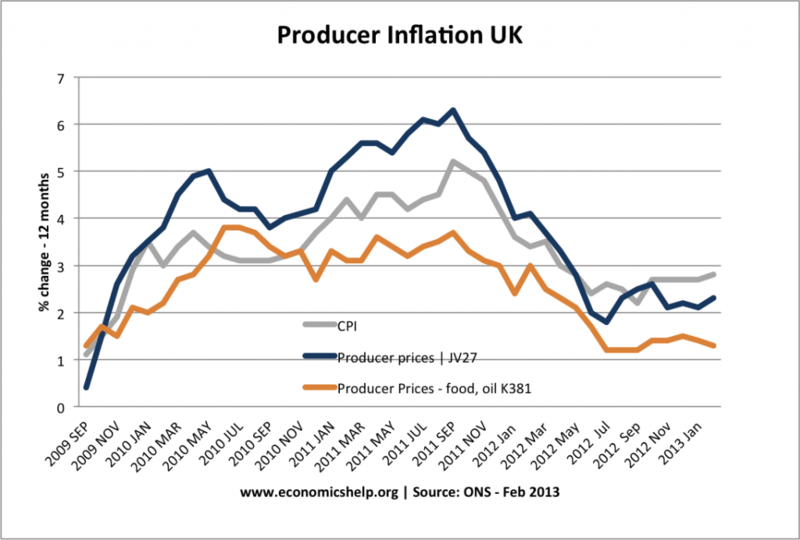 However, if producer prices rise throughout 2013, this will contribute to higher CPI inflation. Factors causing producer price inflation? Depreciation in exchange rate. If there is a depreciation in the exchange rate, then the price of imported raw materials will increase. If the Pound appreciates, the cost of inputs will decrease and producer price inflation will fall. Commodity prices. Rising commodity prices (e.g. speculation on price of oil) will push up the broader measurer of producer prices. Strong demand. If there is a high rate of economic growth, this will cause rising demand for raw materials and will tend to push up prices. In a recession, we would expect lower demand and more limited producer inflation. Supply of raw materials. Shortages of key raw materials will push up input prices. Similarly, a glut in supply of metals, food or oil, would push prices down. Labour costs. Labour costs and labour productivity will affect producer prices. Rising unit labour costs will increase the cost of production and cause firms to seek to increase prices. Why do producer prices tend to be more volatile than headline inflation? These graphs suggest input prices are more volatile than producer prices, and producer prices are more volatile than consumer prices. Why? Demand for input prices tends to be more price inelastic. An increase in supply of oil, leads to a significant fall in price. Demand for retail goods tend to be more price elastic. It is harder to pass on price increases to consumers for retail products. Producers will absorb some of the input prices to keep prices more stable. Firms don’t want to keep changing costs for psychological reasons and the menu costs involved. It is the same with retailers, there are benefits to keeping prices stable and not changing prices every time raw material prices change. Raw materials are only a % of final price. If coffee beans increase in price 50%, it will have a significant effect on the price of coffee produced by a firm like Nescafe. However, coffee beans may only account for about 2% of the total price of a coffee on the High street (see: Price of a Starbucks). Even if the price of coffee beans doubles, the price of a Starbucks may only increase 5p. 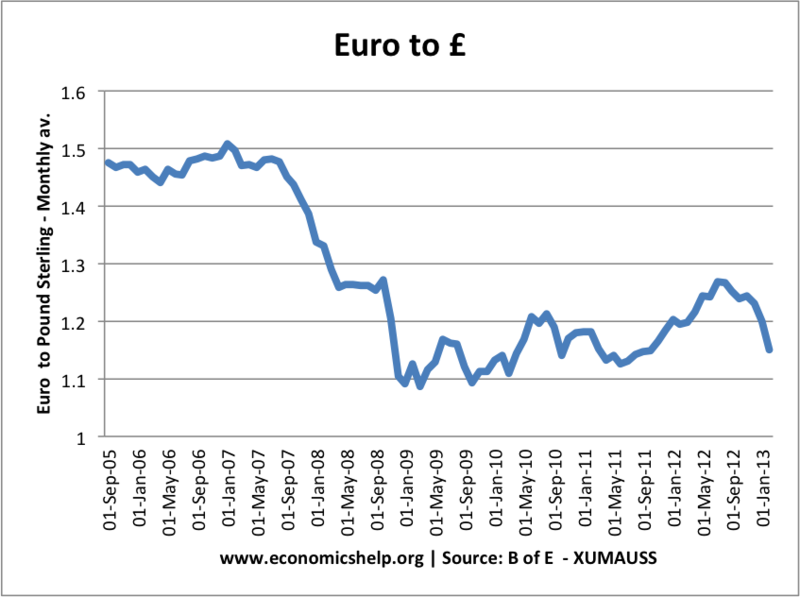 From Sep 2011 to May 2012, there is an appreciation in the Pound Sterling. During this period there is a fall in the producer price inflation. (Bear in mind several factors will affect producer inflation apart from exchange rate. Also, there may be time lags, with delays between an appreciation and receiving lower import prices.